Trade pacts create tectonic shifts in national economies. They impact the lives and jobs of millions of people and the fortunes of entire industries. As the TPP nears an up or down vote in Congress this spring (no amendments are possible), there will be heated arguments about winners and losers, and which workers, businesses and industries will fall into each camp. There is, however, one thing that is certain: the animal world will be on the losing side. A central goal of trade pacts is the harmonization of international regulations, known as regulatory coherence. In order to smooth out a jumble of international codes and regulations, the meeting point tends to shift down towards a lower common denominator. Regarding animal welfare standards, U.S. meat and dairy producers set their own, or more accurately, fail to set meaningful standards. And since there is not a single federal statute covering the day-to-day treatment of farmed animals, this is essentially the “set point” under which the TPP will expand trade. Any country that might in the future choose to set higher standards for the treatment of animals could be accused of creating barriers to trade. In open markets, purchasers of commodity products, i.e. those that are not easily differentiated such as oil or wheat, buy from the lowest cost suppliers, since costs (including transportation) are usually the sole purchasing consideration. Corn and soybeans, the central ingredients in the feed given to factory farmed animals, are commodities. Most factory farmed meat and dairy products are considered commodities as well. The U.S. has an enormous advantage in agriculture. Because of its unusually fertile land, temperate climate, and ample water resources, the U.S. is especially efficient at growing massive amounts of corn and soybeans, the major input cost in raising factory farmed animals. And because the U.S. government looks the other way as agribusiness pollutes the land and water, depletes aquifers and degrades the soil, the food industry is able to externalize these expenses, thereby reducing production costs. Additionally, the government subsidizes the production of monoculture corn, further reducing selling prices. 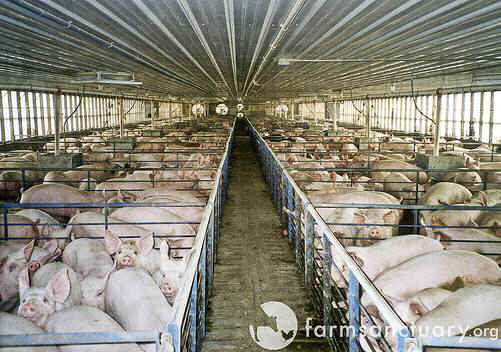 The U.S. also knows how to raise farmed animals at the lowest possible costs, having created the factory farm model (also known by the industry term CAFOs, or concentrated animal feeding operations). Agribusinesses speed up the growth cycles of animals with unnatural and chemical-laced feed, tightly confine them indoors or in manure-filled feedlots, and systematically amputate body parts (including tails, testicles, teeth, toes and beaks) to maximize profits. U.S. agribusiness is extremely enthusiastic about the TPP and the prospect of exporting more pork, beef, chicken and dairy products. With domestic meat consumption on a slight decline, this is the only path to significantly higher revenues. Undeveloped markets are particularly enticing since the competition is mostly made up of small farmers grappling with high production costs and lacking in political clout. Not only will U.S. corporations quickly increase exports, they will also set up factory farming subsidiaries in undeveloped markets, including vertical supply chains that maximize efficiency. If the TPP passes, factory farms will also expand due to the elimination of farm protections in highly developed nations. For many years, Japan has been protecting its beef producers. As tariffs and quotas are reduced, smaller operations in Japan will be unable to compete with cheaper imports from the U.S. Due to the lower prices of American beef, Japanese meat consumption will undoubtedly increase, leading to more imports and more cattle feedlots in the U.S.
Post TPP, large-scale, low-cost producers will thrive, while smaller operations will struggle. In any commodity market, corporate success is based on easy access to low-cost resources, economies of scale that stem from large production capabilities, and a relentless focus on cost-cutting. In such a market, any operation that expends time or resources to minimize the abuse of animals or the environment will be at a competitive disadvantage. The business will either fail or be forced to find a niche market supported by consumers that value those efforts (which will be rare in developing nations). As factory farmed meat and dairy products become less expensive, more widely available, and more actively marketed by powerful corporations, meat consumption will grow. And billions more animals will lead tortured lives on factory farms. A real-world example of the expected impacts of agreements like the TPP can be seen in the North American Free Trade Agreement (NAFTA) and its impact on meat consumption and factory farming in Mexico. Since the passage of NAFTA in 1994, U.S. hog exports have multiplied seven-fold and poultry exports have quadrupled. The industry trade magazine World Poultry bluntly explains that NAFTA “has contributed to unprecedented growth in poultry production.” In the two decades after NAFTA, with supply steadily increasing and prices decreasing, Mexico’s per capita consumption of eggs more than doubled and chicken consumption almost tripled. The growth was almost exclusively supported by U.S. exports from factory farms. Corn and soybean exports from the U.S. soared as well. Unable to compete, Mexican farmers and their families either moved to the cities or became a part of the post-NAFTA influx of migrants to the U.S.
American companies further benefited by establishing subsidiaries in Mexico. Within a few years of the agreement, two of the largest meat producers in Mexico were the American companies Smithfield and Tyson. Aware of this history, the meat lobby, which was well represented at the TPP negotiating table, sees Mexico-sized opportunities in the markets of Vietnam, Malaysia, Peru, Chile, and potentially Indonesia, which has the world’s fourth largest population and has expressed an interest in joining the pact. Simple back-of-the-envelope calculations will show that we cannot protect wildlife if meat consumption continues to dramatically grow—as the U.N. predicts it will under current trends. One-third of the world’s arable land is currently devoted to growing feed for farmed animals. If the rest of the world were to match America’s level of animal product consumption, we would need another Earth just to grow animal feed. Given the intense worldwide pressure on arable land, rainforests are cleared and ecologically sensitive areas are farmed to supply the constantly increasing demand for animal feed. The direct environmental costs of the expansion of factory farming exacerbate the greatest natural threats to life on earth. The diversion of more resources to meat and dairy production leads to more monoculture farming, degradation of the soil, pollution of water supplies, dead zones in the oceans, and increasing levels of greenhouse gas emissions. All of these factors create overwhelming pressures for wildlife. Most environmental protection groups have come out firmly against the TPP, noting especially that the issue of climate change is not even mentioned in the 6,000 pages. To claim, as a few supporters do, that the symptomatic measures in the agreement protecting iconic species or tackling the illegal wildlife trade will sufficiently protect wildlife is wishful thinking. Unfortunately, only a few environmental and animal protection organizations are speaking out against the TPP’s threat to all animals due to the expected expansion of factory farming. The TPP includes a highly contentious mechanism called Investor-State Dispute Settlement that allows corporations to sue governments for lost profits due to actions that unfairly obstruct trade. Were the U.S or another country to decide, for example, to no longer accept imports of hogs that were tightly confined in concrete and metal indoor pens, they could be sued by corporations that deem those standards an obstruction of trade. The determinations of financial settlements by international arbitration tribunals would be legally binding and could not be appealed. It is more than likely that the TPP would turn out to be a potent weapon against animal activists demanding better treatment for farmed animals. Corporate challenges claiming that higher standards illegally block trade would be resolved by arbitrators that have no precedent for, and likely no interest in, higher animal welfare standards. Ken Swensen volunteers for ACTAsia supporting their work teaching Chinese schoolchildren compassion for animals and respect for the environment. A lifetime New Yorker, Ken runs a small business and has an MBA from New York University. And keep advocating for animals, who have no way to advocate for themselves.